Shaikh al-Tūsi, “Abū Ja`far” Muhammed ibn al-Hassan (385 - 460 A.H./995 - 1068 A.D.), is one of the greatest literary figures in Islamic history, a scholar the scope of whose knowledge encompassed Islamic history, fiqh and hadīth. He is called “Tūsi” after his birthplace, the city of Tūs, Khurasan, Iran. After Tūsi’s demise, Tūs expanded in area, gradually becoming a center of knowledge and culture especially after Imām Ali ibn Mūsa al-Rida A had resided in it. The Imām’s presence attracted scholars and seekers of knowledge from all the corner of the then Islamic world. Sheikh al-Tūsi was taught by the greatest scholars of his time who included Sheikh al-Mufīd, Sayyid al-Sahreef al-Murtada, brother of al-Shareef al-Radi, compiler of Nahjul-Balāgha, who kept company with Sheikh al-Tūsi for twenty-eight years, directing and helping the growth of his academic talents, so much so that Sheikh al-Tūsi became a candidate for leading the nation after the demise of his mentor, and this is exactly what took place. Al-Qā’im bi Amrillāh was the ruler of his time. Recognizing the distinction of Sheikh al-Tūsi, he ordered a special chair to be designed and made for the scholar, a chair which came to be known as that of scholarship and tutorship, one of its kind at the time. Sheikh al-Tūsi, therefore, used to sit on that chair and deliver his sermons and speeches. This went on till the year 447 A.H./1055 A.D. when the flames of sectarianism swept Baghdad brought by Turkish Saljukes who burnt the Sheikh’s house, library and chair. The Sheikh’s library was known as the Shah-pur Library which is described by the great historian Yāqūt al-Hamawi as the greatest in the entire Islamic world. The Turks schemed to get the two main branches of Islam, the Shi`i and the Sunni, to be at each other’s throats. 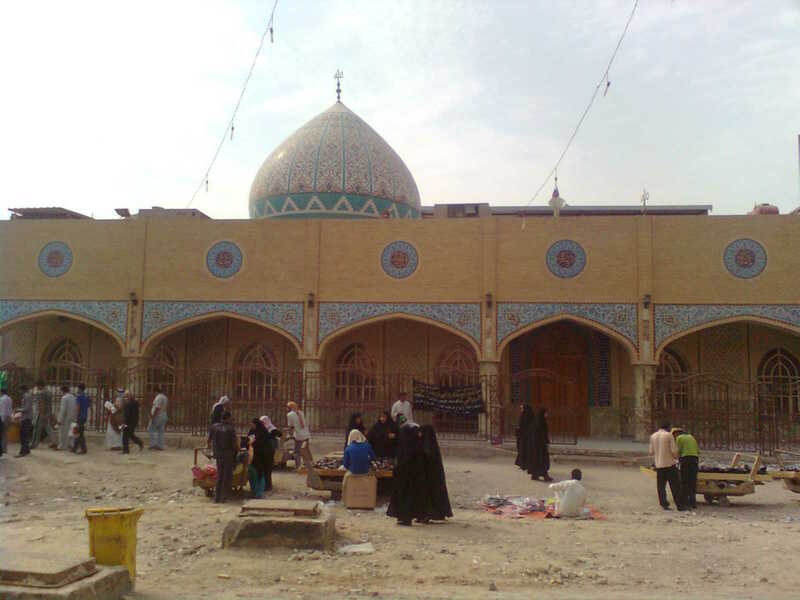 This forced Sheikh al-Tūsi to migrate to the city that houses the Shrine of the Commander of the Faithful Ali A, namely al-Najaf al-Ashraf, Iraq, where he established a great university, turning this city into a capital for knowledge and a center for scholars, one which has ever since been attracting men of virtue and seekers of knowledge. Thousands of senior faqīhs, jurists, speakers, virtuous exegetes and historians have graduated from it and will always continue to do so, Inshā-Allāh. After his death, the grave of Sheikh al-Tūsi turned into a lofty school for disseminating Islamic knowledge and a center for the scholarly hawza, theological seminary, and for its most prominent religious authorities. 6 ـ تلخيص الشافي ـ في الإمامة، وأصله للشريف المرتضى ( الشافي ). Talkhīs Al-Shāfi: a summary of the book titled Al-Shāfi by al-Shareef al-Murtada, and it deals with the subject of imāmate. 16 ـ المبسوط ـ من أجلّ كتب الفقه. يشتمل على سبعين فصلاً. Al-Mabsoot (refer to the text above): one of the most prestigious books of fiqh; it contains seventy chapters. 18 ـ المفصح ـ في الإمامة، وهو من الآثار المهمّة. Al-Mufsih: deals with the subject of Imāmate, and it is one of the important sources in this topic. 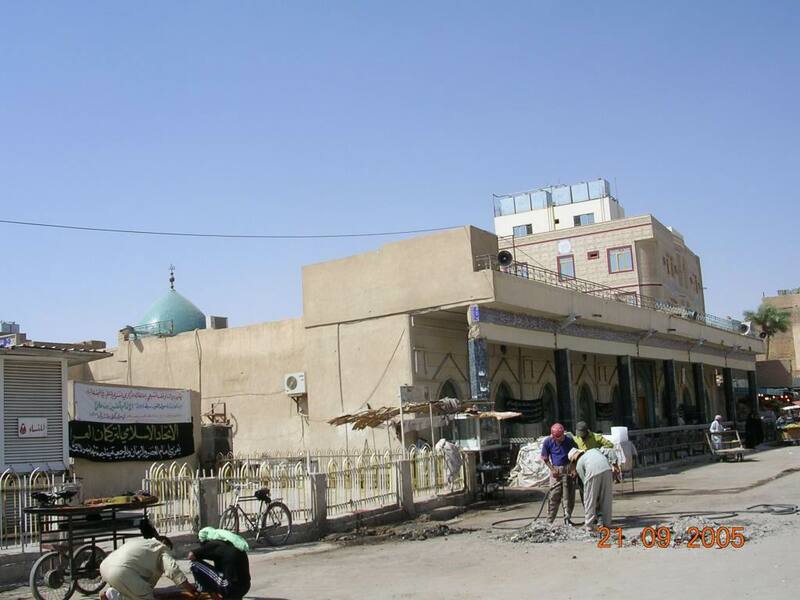 Kitāb al-Ghaiba, Al-Najaf al-Ashraf, Iraq. Al-Amāli, Al-Najaf al-Ashraf, Iraq, 1384 A.H./1964 A.D. (Iran, 1313 A.H./1895 A.D.). Sheik Abu Jafar Toosi has been held in very high esteem among the scholars of the Shia School. His greatness can be gauged from the very fact that he was the author of two of the four most important books of the Shia Faith. We have mentioned about these four books earlier in this series of talks. The two books authored by Sheik Toosi are Tahdhib al-Ahkam (andAl-Istibsar. The opinion of leading scholars is that after Sheik Toosi no later scholar took courage in his hands to issue Fatwa against any matter dealt with by him. Some people have even said that for a long period of 80 years of Sheik Toosi’s demise no Mujtahid came up. Even if there were Mujtahids, they didn’t feel the need or necessity of issuing Fatwas. Whenever any Mujtahid thought of giving a Fatwa, he confessed that how could he issue an edict on a matter which was dealt with such authority by Sheik Toosi. The greatness of Sheik Toosi can well be gauged from the fact that till about 100 years ago, he was remembered with the title of Ibteda e Bahisht or The threshold of the Heaven. The word Sheik is from the Arabic lexicon that means a person who is the chief or the leader of a tribe. This title has been used with the names of almost all eminent scholars. But Sheik Toosi has been accepted as the leader or the guide of Shias in such a manner that in the books of Fiqh wherever the term Sheik appears it meant only Sheik Toosi. The term Sheik literally became synonimous with this great scholar. If some author writes that the Sheik had such –and- such opinion on any matter, certainly he refers to Sheik Toosi! Similarly during the last hundred years another author of similar eminence was born who was Sheik Murtada Ansari. With his rise in eminence, the word Sheik started becoming synonymous with Sheik Murtada Ansari. From the 5th Century H to the 13th Century H , Sheik Toosi was referred to only as Sheik. But from the 13th Century, Sheik Murtada Ansari shared this title with Sheik Toosi. This illustrates the eminence of Sheik Murtada Ansari. The title of Sheik Toosi is Sheik but he was also known as Sheik al Taifa. His Kunyat is Abu Jafar. His given name is Mohammed and he is remembered as Sheik abu Jafar Mohammed. It is a very pleasant coincidence that the three scholars who collected and compiled the books of Hadith in the early period and the three scholars who came in the later period bore the given name of Mohammed. Another surprising coincidence is that the Kunyat of the authors of the first three books has been Abu jafar. Sheik Toosi’s father’s name was Hassan, the grand father’s name was Ali and the great grand father was also Hassan. He hailed from a town in the Khorasan Province of Eastern Iran. The town is extinct now but it was a center of some eminence for Islamic Studies those days. Sheik Toosi was born in Ramadan of 385 H four years after the passing away of Sheik Sadooq in 381 H. The Providence gave birth to the true successor of Sheik Sadooq within four years of his demise in the person of Sheik Toosi. Sheik Toosi died on 22 Moharrum of the year 460 H at Najaf e Ashraf. Thus he lived for 75 years in this world. He was interred in the compound of his own house which became the permanent place of his eternal rest! Sheik Toosi has done tremendous work in the literary field and has written books that are in a class by themselves. His initial education was provided by his father. At the age of 23 years he migrated towards Baghdad. Since Baghdad was the capital of the Abbasids ever since the times of Mansoor Duanaqi, barring a small period when the capital was moved to Samarra Baghdad was also the center of Islamic Studies from the times of The Sixth Imam (a.s) till the period when Sheik Toosi flourished there. Eminent scholars were the residents of this city. The 10th, 11th and 12th Imams (a.s) appointed their 4 deputies with their head-quarters too in Baghdad. Thus the Shia population continued to increase progressively in the capital city. They did have the numerical strength but the establishment of the time was not too friendly for them. The other inhabitants of the city developed animosity for them because of their numbers and the all round progress achieved by them. The establishment therefore instigated riots between the two communities. Because of this, the followers of Aal e Mohammed (s.a), who were peace loving people, had to face much trouble from their adversaries who had the tacit support of the establishment. Their homes and hearths were attacked and they were mercilessly killed. A little while after these events started, Sheik Mufeed reached Baghdad. When Sheik Mufeed made his presence felt in the city, in the year 408 H, Sheik Toosi was a child of one year. When Sheik Toosi migrated to Baghdad, the name of Sheik Mufeed was very famous and the talk of the town. People used to join his school on knowing that he was the chief of that institution. Both Sunni and Shia seekers of knowledge vied with each other to attend classes with him. Therefore Sheik Toosi too joined lessons at the school of Sheik Mufeed at the age of 23 in the year 408 H. At that time Sayed Murtada was constructing his house in Baghdad. The Sayed’s family was already well known in the city of Baghdad and his brother, Sayed Radi, was appointed as an important functionary to maintain a roster of the sayeds (Naqazat) by the Abbasid Establishment. Sheik Toosi started taking lessons with Sheik Mufeed and, later on, with Sayed Murtada. We must mention here that Sheik Toosi was such an ardent seeker of knowledge that he took lessons from 138 scholars. But basically, his chief mentors were Sheik Mufeed and Sayed Murtada. After some time Sheik Mufeed expired and the mantle of the leadership of the Shia Community fell on Sayed Murtada. He was now the chief of the biggest educational institution in Baghdad. Sayed Murtada was now the Marja, Pontiff or the Chief Mujtahed of the Shias. Since his younger brother, Sayed Radi, too expired around this time, he was appointed to the position of Naqazat in his place. Sayed Murtada is the great personage about whom the Sixth Imam (a.s) has said that Allah had assembled the world and the Hereafter for him. I have already mentioned about his worldly affluence and his eminence in knowledge and learning. While Sheik Toosi visited him for taking instructions, he noticed the intelligence of the student and the dedication to the urge of learning. Thus Sheik Toosi became one of his favorite students. He also became the deputy of Sayed Murtada over a period of time. The Sayed used to take his suggestions and advice in several matters. Sayed Murtada used to respect the scholars and the students. He used to take minute care of the needs of those who were staying at his seminary for studies and research. He opened his purse strings for the needs of his disciples. Sheik Toosi was getting a scholarship of 12 Dinars every month from Sayed Murtada. It will be a substantial amount in today’s terms. The students were getting the scholarship according to their personal proficiency. Sheik Toosi was given the highest amount as scholarship when compared with other recipients. Sheik Toosi remained with Sayed Murtada till the Sayed’s demise in 436 H.
.Now Sheik Toosi assumed the leadership of the entire Shia Community in the world. The adversaries of the Shias felt that they were consolidating under Sayed Murtada and the process went forward with Sheik Toosi at the helm. They thought that the way to curb this was to create fights between one community and the other. Therefore, during the time of Sheik Toosi, the worst riots in the annals of the history of the city of Baghdad happened during the year 448 H. These riots were the cause of the downfall of the Abbasid caliphate. The predominantly Shia neighborhood of Karb was burned and razed to ground.In a span of about a hundred years the formidable Abbasid Empire crumbled. The worst affected were the followers of the Progeny of Mohammed (s.a). The culmination of this calamity was the death and destruction caused by Halaku Khan. Prior to this calamity the mantle of the leadership of the community had been transferred to Sheik Toosi. The caliph of the time had given an audience to the Sheik and endowed him with gifts and honors. To honor him the caliph had presented to him a chair. It was the custom of the Abbasid Caliphs that eminent and erudite persons were gifted chairs by them. Sheik Toosi used to conduct his classes sitting on this chair. When the caliph saw the content of the Ziarat in Al Misbah, he called Sheik Toosi to his presence. He reached the court. The caliph of the time, Al Qaim Billah, pointed towards the first lines of the ziarat and asked him who were the four persons being cursed therein. Sheik Toosi asked him who had created a misapprehension in his mind? He further added that he had mentioned the truth through the writing of the Imam (a.s) that his curse on the First, the Second, the Third and the Fourth. He elaborated saying that the First cruel one was Qaabeel who killed his own brother Haabeel. The Second cruel one was the person who severed the rein of the she—camel of Hazrat Saleh (a.s) and earned the wrath of Allah. The Third cruel one was the assassin of Hazrat Yahya bin Zakariya(a.s), who, just to please a dancing girl, severed the head of Hazrat Yahya (a.s) and placed in a tray to present it to her.The Fourth cruel person was Abd ar Rehman ibne Muljim who was the assassin of Hazrat Amir al Momineen (a.s). The caliph was convinced with the argument of Sheik Toosi. He angrily asked the persons who brought the book to his presence. He ordered severe punishment for those persons. With his prudence and presence of mind, Sheik Toosi was able to ward off a calamity for himself and for his friends. His adversaries now started a propaganda campaign with the populace in Baghdad against Sheik Toosi. Therefore, a riot was engineered in Baghdad during the year 448 H and the neighborhood of Karb was attacked and the entire habitation was put to fire.They also burned the chair that the caliph had given to Sheik Toosi to honor him. They also set fire to his library that was an invaluable collection of books. There were about 90,000 books collected by him at great pains and spending many years of his life. There were also 10,000 books of Sayed Murtada in the library which were gifted to him by his mentor. There were also 10,000 books collected by the prime minister of the Abbasi, Abul Nasr. Abul Nasr’s collection of books was rated best those days. Not only that the library was burned, the entire locality was put to fire but the riot spread to Kazimain and the sarcophagus of Imam Moosa Kazim (a.s) was demolished and burnt. In his discretion, Sheik Toosi didn’t retaliate. He quietly migrated from Baghdad to Najaf e Ashraf. There he started living in a small tenement. That was the time when Najaf e Ashraf had its first few inhabitants. It is common knowledge that Sheik Toosi was the founder of the city of Najaf. In fact Najaf e Ashraf assumed its importance during the time of the Sixth Imam (a.s) when the famous incident of Haroon al Rashid happened. You are aware that when Imam Hassan (a.s) and Imam Hussain (a.s) along with their sister, Hazrat Umm Kulthum, quietly interred their father, Ameer al Momineen (a.s) and none else had knowledge where he was buried. At that time people were unable to understand why so much of secrecy was observed for the funeral of the Imam (a.s). But when the time of Hajjaj bin Yusuf came he dug up 3000 graves with the intention of desecrating the remains of Hazrat Amir al Momineen (a.s). The Abbasids, although they too were the enemies of Ahl al Bayt, they had to perforce maintain respect for the Infallibles (a.s). One day Haroon went on a hunt and he put his hunting dogs after a deer. During the chase the deer climbed over a mound. The hunting dogs suddenly stopped in their chase. They were just going round the mound but didn’t have the courage to climb up and catch the deer. The deer fearlessly sat on the mound. He looked at the scene in great surprise and asked the people in the neighborhood about the reason of the strange incident. He also asked them what place it was.An old person from the tribe of Bani Asad said that they too were not sure but their elders had told them that Hazrat Amir al Momineen (a.s) was interred at that spot. Haroon contacted the Seventh Imam (a.s) and confirmed the fact from him. He wasn’t convinced even then and got the grave opened and the remains of the Imam (a.s) were found as fresh as they were at the time of his martyrdom. They also noticed the mark of the blow on his head that was struck by Ibn e Muljim. Haroon got the grave back to its original position and got a mausoleum constructed there with ordinary stones. The companions of the Sixth, Seventh and the Eighth Imams (a.s) had started to build their habitations around that place. Thus sprang a small neighborhood but still there was no seminary there. When Sheik Toosi was at the age of 59 years, in 448 H, he moved from Baghdad after a sojourn of long 40 years, to Najaf e Ashraf. It was still a small settlement with scant facilities for amenities like water etc.Today we call ourselves the Shias of the Ahl al Bayt (a.s) but we seldom give a thought to the facts that the great Mujtahids had communicated the word of the Infallibles (a.s) to us experiencing unfathomable hardships themselves. If they had not done, what they did, and sat comfortably at their homes in big cities like Baghdad etc the Faith wouldn’t have reached far and wide to the masses. When Baghdad was captured, the Shias had no shelter to hide their heads. They perforce had to move to Najaf e Ashraf. Najaf those days was a sparsely populated, almost desolate place. In such a place Sheik Toosi started the seminary for the Shia scholars. There was Divine help for his project and the seminary progressed by leaps and bounds. Razi al Deen Ibne Taaoot was an erudite scholar who was known for his piety and learning. He was so careful in his life that he went to the extent of doing even the Mubah (Legitimate) things with due process of discretion. One can puruse his mention in the monumental book Mafateeh. The family draws its title from the book “Taaoot” written by his ancestor. It is such a good book that the family is identified with this name. Sheik Toosi’s daughter went to this family to whom was born Moosa and Moosa’s son was Razi uddin ibne Taaoot. This grand-son of Sheik Toosi was the most eminent Mujtahid of his time. But one may be surprised that he never once gave a Fatwa during his life. He only wrote a small booklet, Hamas. This is the description of the events of the martyrdom of Imam Hussain (a.s) at Karbala. This is one of the most authentic books of Maqatil. Ibne Taaoot was once asked why he wasn’t issuing edicts (Fatwas). He replied that it would be a very big responsibility on him that if he made error of judgement and gave a wrong Fatwa he would be subject to retribution on the Day of Judgement. It is mentioned in the books of history that he was so careful about imparting knowledge that his sons wanted him to teach them the Ism e Azam, of which he was a known exponent. He told them that the Ism e Azam was recorded in his writings and that they must learn about it themselves from them. There is a very interesting incident recorded in the history about Razi uddin. One person had developed a suppurating boil on his thigh. It was giving him lot of trouble. He took treatment from many physicians but to no avail. One day he was sitting on the banks of the river at Samarra and brooding about his ailment and performing the ablution.. At that time five persons came near him and put their hands on his thigh and the wound instantaneously healed. He asked who those five persons were. One of them said, “I am your Imam e Zamana (a.s)!” While departing the Imam (a.s) also said, “When you reach Baghdad, people will be curious to learn about your miraculous cure! The ruler there will call you and try to give you gifts. You shouldn’t reveal to him this incident. You must go to my son, Razi Uddin Ibne Taaoot. He will provide you financial assistance.”. Later on the person reached Baghdad. The grapevine had carried the news about what happened to him before his arrival there. As soon as he entered the precincts of the city, people snatched pieces of his robe thinking that it was an offering from the Imam (a.s). The ruler called him and wanted to give him valuable gifts. The person refused to accept them. He then approached Razi Uddin who was also present at that moment. We can well imagine the august status of the family of Sheik Toosi that his offsprings were Mujtahids and his grandson was mentioned by the Imam e zamana (a.s) as his son. Now, let us proceed further. His other daughter was married to Ibne Hilli and his son was born in the progeny of Ibne Taoos, the most eminent Mujtahid. Sheik Toosi wrote the book Nihaya with such sincerity that Hazrat Amir al Momineen personally gave it the sign of his approval. Sheik Toosi had the maximumdisciples in his time. He had as many as 300 Mujtahids among the ranks of his disciples. In these modern days there will not be more than 10 to 15 Mujtahids. He had innumerable Sunni and Shia students and seekers besides the Mujtahids to whom he had given the cerifcate of approval. On the night of Saturday 22 Moharrum 460 H this great scholar breathed his last in Najaf e Ashraf. The same night he willed that he should be interred in his own house. Therefore his burial took place there. Later on the place was converted to a mosque and is now known as Masjid e Toosi. Those who have had the privilege of going for the Ziarat of Hazrat Amir al Momineen might remember that on the northern side of the mausoleum of the Imam (a.s) the Masjid e Toosi is located on the other side of the road..Since the mosque is located exactly opposite the mausoleum the entrance is known as the Baab e Toosi. 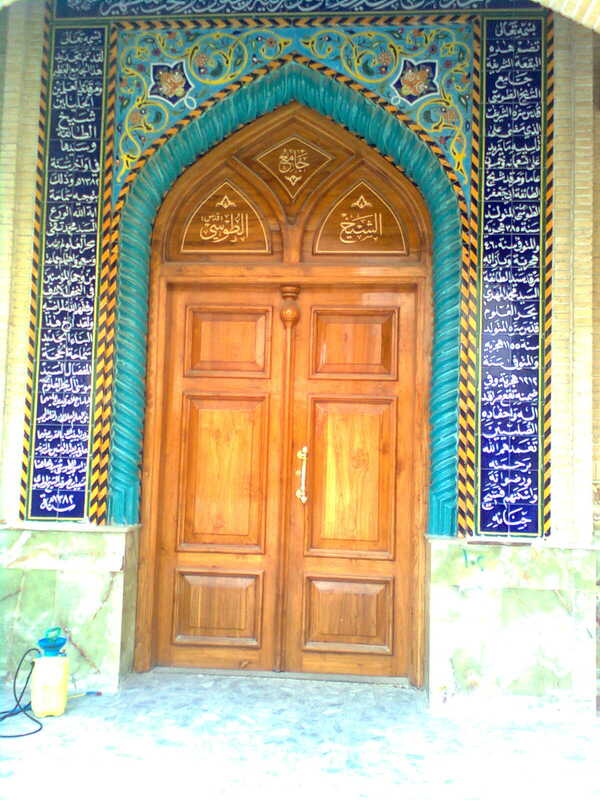 In 1198 H the mosque was renovated by Sayed Mehdi Dar al Uloom. But with the change of the establishment, the mosque was removed for making the wider road. In the year 1384 H the Dar al Uloom family reconstructed the mosque in grand style. The importance of the mosque is that the Mujtahids give instructions to their disciples in Najaf and Qum which is known as Dars e Kharij. The Martyr Baqir al Sadr used to give his dars e Kharij to the disciples from the pulpit of Masjid e Toosi. Another very significant thing is that this is one of the places in Najaf e Ashraf from where supplications made by devotees are answered. Therefore the scholars and Mujtahids and Ulema make it a point to visit the mosque after they pay homage to the Imam (a.s) to recite the supplications. Tus. There is a difference of approx. 200 years between their eras. His name was Muhammad ibn Hasan ibn Ali ibn Hasan and he was born in Ramadhan 385 A.H. in Tus (Iran).His early years were spent in Tus where he was taught by his father who was a great A'lim of his time. Shaykh Mufeed. When Shaykh Mufeed died he studied under Syed Murtadha ('Alamul Huda). He soon became Syed Murtadha's star student. After the death of Syed Murtadha in 436 A.H., he became the leading Shia 'A'lim and acknowledged as the Marja' of the Shia world. In 448 A.H. during the reign of Qaim ibn Amr Allah;the enemies of Ahlulbayt were jealous of the progress made by the Shia Ulema in particular Shaykh Tusi. They started influencing the Khalifa by saying that Shaykh Tusi was one of those who abused the first three Khalifa's - Abu Bakr, Uthman & Umar.. They produced the book of a'mãl called Al- Misbãh and picked on Ziyarat e Ashura which says "...la'na on the first, second third and fourth who committed injustices...." Shaykh Tusi was called to the court and asked to explain. He said the first was Qabil, the second the one who killed the she-camel of Nabi Salih, the third one being the killer of Nabi Yahya, and the fourth - Abdur Rahman ibn Muljim (One who struck Imam Ali (A.S.) on 21st Ramadhan). The Khalifa was satisfied.Seeing that they were not successful they started causing rifts within the general public causing Sunni-Shia riots in Baghdad - 448 A.H. (1056 A.D.). by Shaykh Murtadha). The riots spread to Kadhmayn and Shaykh Tusi decided to move to Najaf with some of his students. His students included his son - Syed Hasan. It is he who laid the foundation of Islamic knowledge in Najaf establishing madrasas and making it a flourishing learning centre (albeit destroyed by Saddam). Through him countless benefited, from whom 300 became Mujtahideen. He is the author of two of the four main books of Ahadith - Al-Istibsãr and Al-Tahdhib. The latter contains 393 chapters with 13,590 Ahadith. He wrote many other books. His authority and impact was such that after his death for 80 years no A'lim gave any fatawa which were different from Shaykh Tusi's. 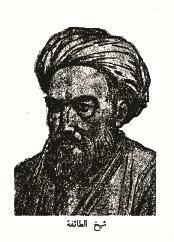 One other reason was also that his book Al-Nihaya was disputed by some Ulema from Baghdad. They came to Najaf to resolve the dispute asking for help in the haram of Imam Ali (A.S.). All three saw Imam in their dream authorising the book. He had two daughters and one son. All became Mujtahideen. His son- Syed Hasan was known as Mufeed the second. His grandchildren to became eminent scholars. No Aalim in either the Sunni or Shia world covered such wide fields of study as Shaykh Tusi. He died in Najaf on the night of 22 Muharram 460A.H. (1067 A.D.) at the age of 75 years. He was buried in his home as per his wasiyya. The house was converted into a mosque which was later incorporated with the haram of Imam Ali (A.S.) Today it is difficult to identify the original mosque but there is a gate of the haram on the side known as Bãb Al-Tusi.